We are pleased to offer the Ohio GED as part of our PearsonVUE offerings. The GED test is made up of four subjects, broken down into separate exams. You do not have to take all four tests at once - you can space them out however it suits you and go at your own pace. 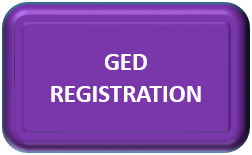 Click the purple box for the GED website, use the sign-up box in the top right hand corner of that website to register. CLICK HERE for more information on the Mathematical Reasoning exam. CLICK HERE for more information on the Social Studies exam. CLICK HERE for more information on the Reasoning Through Language Arts exam. CLICK HERE for more information on the Science exam.